At the Planning Committee held on the 27th November 2008 plans were passed for the new Municipal Waste Re-cycling Facility which will be built on the old South Kirkby colliery site and marks the beginning of what will be ground breaking achievements for Wakefield District Council and its re-cycling rates in the future. With modern high tech. 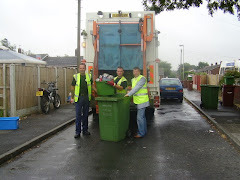 plant and methods we can look forward to achieving re-cycling rates far in excess of the government targets that are currently being set and therefore reduce the amount of waste we, the public of Wakefield will be sending to landfill. We are also looking to bring in to the district manufacturers who will use the re-cycled material at source so that we can further reduce our overall carbon footprint.